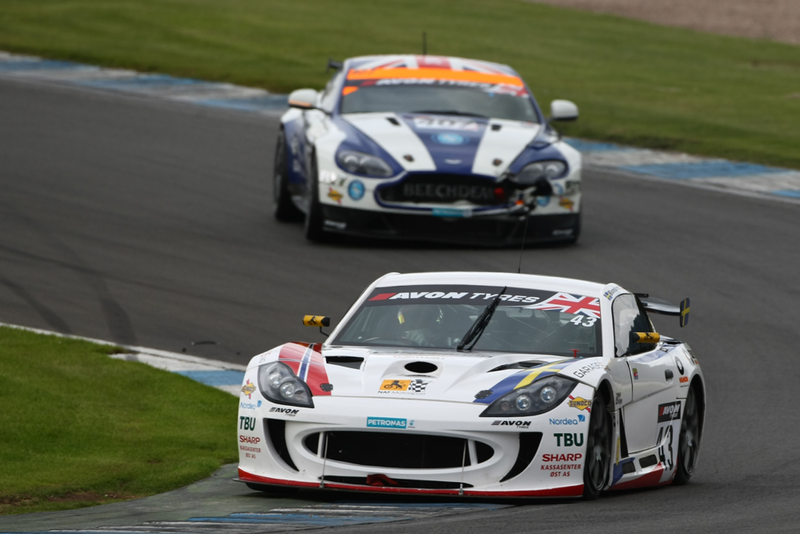 Century Motorsport travelled to Donington Park this weekend for the final round of the 2015 Avon Tyres British GT Championship. Up to the last rounds at Snetterton, the season had been a challenging one for the outgoing team champions. 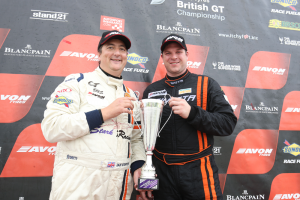 Sporting an extended line-up with Ian Stinton and Team Principal Nathan Freke teaming up to make their British GT return, joining Aleksander Schjerpen and new co-driver Fredrik Blomstedt, the team were hoping to end their season on a high and compliment the results from Snetterton. Saturday morning got off to a difficult start for the team, purely as a result of mixed conditions in both sessions. A drying track in Free Practice one marginally favoured those on wets, where as Free Practice two started dry, but a heavy downpour mid-session ended any hopes of achieving some valuable running. Qualifying remained dry throughout, Aleskander Schjerpen starting the session for the #43 with Ian Stinton opening the account for the #73. Despite a break in the session due to a brief red flag, Schjerpen finished the session with the fifth fastest time. After a brief venture into the gravel, Stinton who was finding his feet with the GT4 specification G55 set the 13th fastest time. Fredrik Blomstedt and Nathan Freke took to the track in their respective cars for the Pro qualifying session. Blomstedt’s fastest time was good enough to secure a fifth place starting position for the race, with Freke’s best lap moving his car up two places to start Sunday’s race from 11th. After a drama free morning warm-up, attentions turned to the final race of the season that would be run over two hours around the challenging Donington Park Grand Prix circuit. Starting from fifth, Aleksander Schjerpen made a lightning start to the race, promoting himself to third at the end of the opening lap. During an action packed sequence of laps, Schjerpen managed to stay out of trouble and approaching the Safety Car period on lap 14, had moved himself up to second. Ian Stinton worked hard over night with the team to achieve the most from both himself and his new mount. A strong start to the race saw him move up several places, and by just lap fourteen, he was now running in ninth as the Safety Car was deployed. Back towards the front, Aleksander made a strong restart as the track returned to green. Breathing heavily down on the neck of the class leading Aston Martin, Schjerpen was looking for any opportunity to find a way past and into the class lead. Approaching the one hour mark and with it, the pitstop window, Schjerpen dived into the pits to hand over to co-driver Fredrik Blomstedt. Following on from the green flag restart, Ian Stinton resumed his charge up the order. Clearly getting the hang of driving the GT4 specification Ginetta G55, Stinton had now moved himself up to seventh, passing the Academy and JWB-run Aston Martin’s, before making his way into the pits for their driver change. Having to take a 15 second success penalty in the pitstop from the previous round, Blomstedt returned to the track fourth in GT4. Suffering from a lack of mileage around Donington Park compared to his rivals around him, Blomstedt initially got his stint off to a good start to hold station in fourth. Keen to compliment Ian’s opening stint, Nathan Freke left the pits in the #73 Ginetta aiming to quickly move up the order. Clearly showing very strong pace, Freke had moved ahead of the sister Century car into fourth. Continuing his charge up the order, by lap 51, Nathan was now running second in GT4 and rapidly hunting down the class leader. However the team was dealt a heavy hand from the officials, who advised that their pitstop had been too fast by a mere two tenths of a second and must serve a stop and go penalty. Fredrik Blomstedt was starting to get into a good rhythm in fifth, before finding himself in a position to capitalise on those serving pitlane infringement penalties around him and moved up to third. With the hard charging Freke now back filling his mirrors on a recovery drive, Fredrik dropped to fourth as Nathan moved back up the order. Struggling to keep the high-speed Lotus at bay in the closing laps, Blomstedt eventually brought his Ginetta to the flag in fifth. Now charging back towards the front, initially it looked like third would be where Freke would remain. However as the leading Aston Martin duo started to battle for the lead amongst themselves, this provided the ideal opportunity for Nathan to get in on the action. On the penultimate lap, Freke was now on the bumper of the Dennis Strandberg Aston Martin, ready to move ahead. A superb pass into the Melbourne Hairpin promoted Freke to second, which he held to the line, much to the delight of his Century Motorsport team.